Place your cursor over a face to display a name. Teacher on left is Hubba Jones (I think he taught english). The teacher on right needs no introduction for many, but just in case you missed him at school, he is Jack Sweeney (foreign languages), the most inspirational teacher I ever knew! 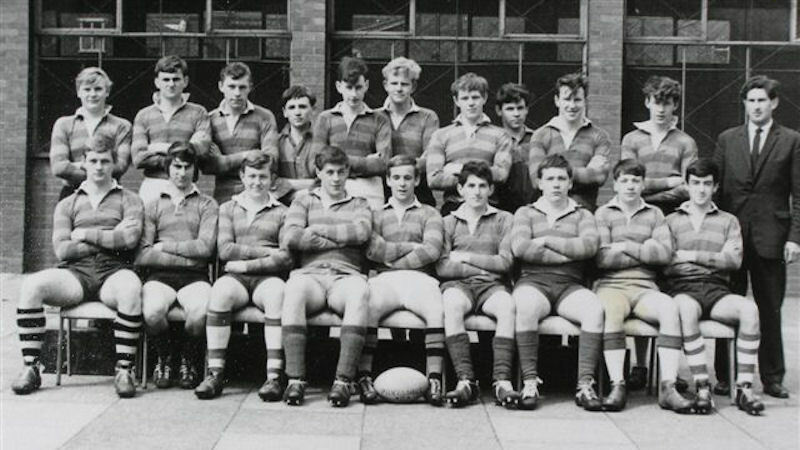 Interestingly - several of these chaps had brothers at the school - Tony Martinez, Rod Chambers, Lloyd, Lol Kay and David Henson; maybe McNaughton too. Well, we weren't very good - about the same level as Quarry Bank, Hillfoot Hey, Cardinal Allen and Gateacre Comprehensive. After all, footie, cross country and hockey had a strong grip on Saturday morning sports before rugby ever began. 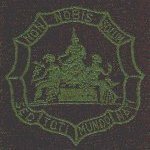 Just not up to the Collegiate's standard, Upholland or Ormskirk. Only ever allowed to play St. Eddies seconds, Wade Deacon Grammar (Widnes) seconds and Cowley (St Helens) seconds. 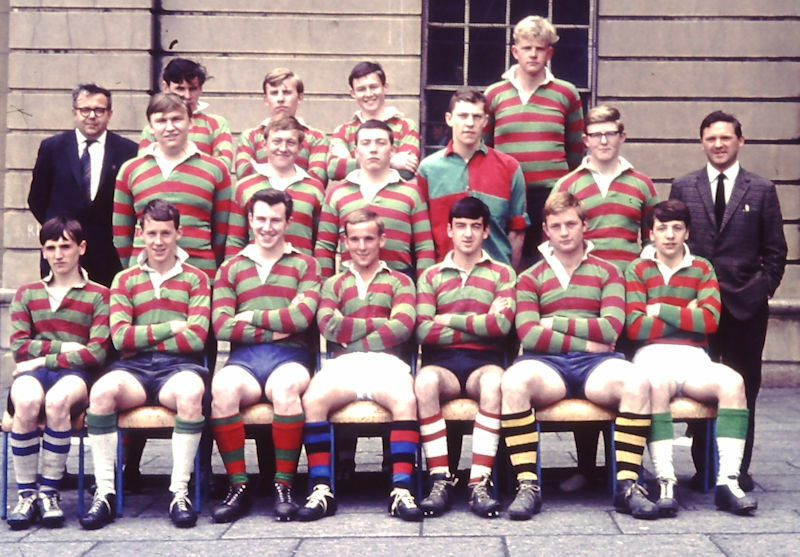 They were good rugby playing schools. 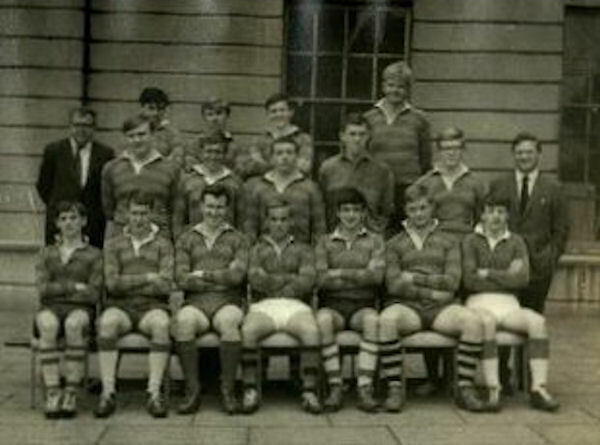 Met up with some of their "star" lads several years later when I joined Liverpool RUFC, they were getting England trials; I was getting a trial for SE Lancs! Need I say more? By the way, I never regretted taking to rugby - a great sport. I have traveled the world with it, from France to Fiji, good friends all over. Doubt I would ever have got that experience through footie! Dave (The Hit Man) Henson was a NCB mining engineer, now retired and living in Greater Manchester. His brother Bobby Henson became a chemmie teacher; I last met him in the East Neuk of Fife, 20 years ago. Paul Rees was a fine athlete, we were in the athletics team together. Dave Rawlinson was a nutter on the pitch - didn't know his own strength. "Chouse" Muncaster, David Henson a pair of "gentle giants"! Photo provided by Jack Sweeney's niece, Gillian Williams. Staff vs. 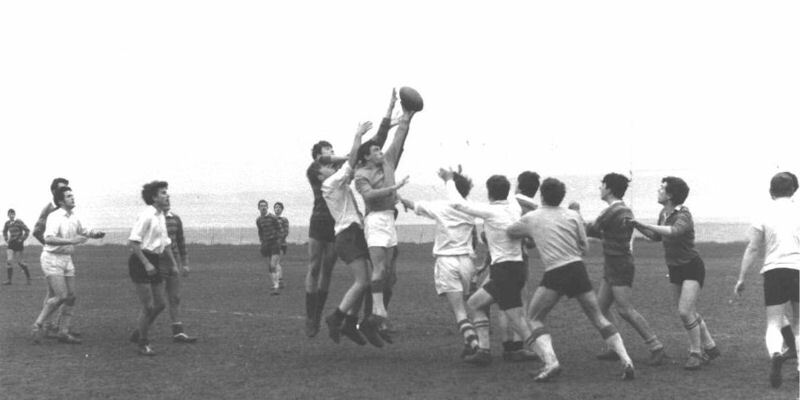 Boys Rugby match at Mersey Road circa 1968. Mike Kingman (staff) wins the ball from the line-out. 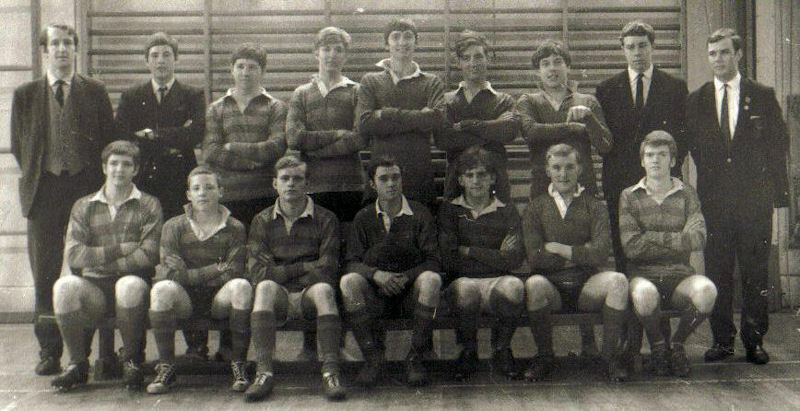 To his right, me, (hooped socks) and behind me in white shirt, dark shorts - Jeremy Eyre (Latin). 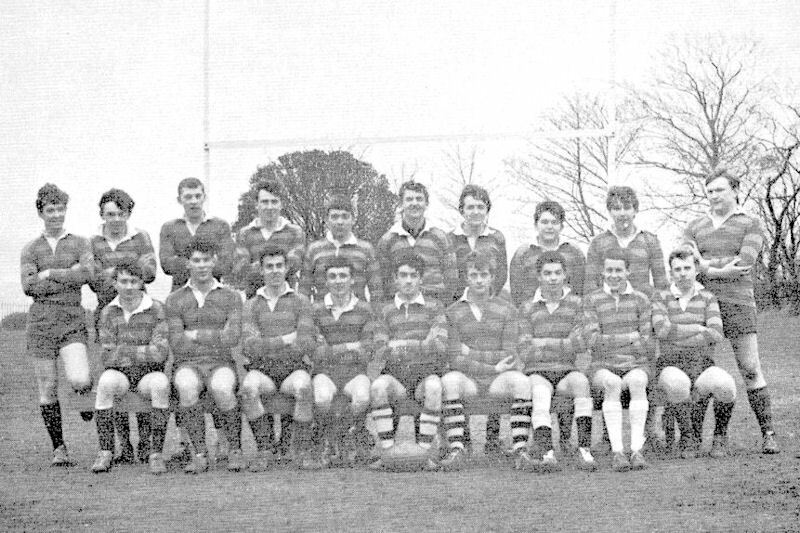 Extreme left (all white) - Robin Hunt (Spanish) and to his right one of the Brandons (S.W.A., I think), a sixth-former playing scrum-half for us. If you have any information relating to or can identify anyone in these photos, please click the button below to send an email. Half colours were awarded at the end of the season. To be awarded half colours, you had to have played for the first team for the majority of the season's fixtures. Full colours were only awarded after consistently good performance as judged by the captain and the relevant master in charge.